I thought you guys might enjoy seeing a few of my Summer flowers potted in recycled items. 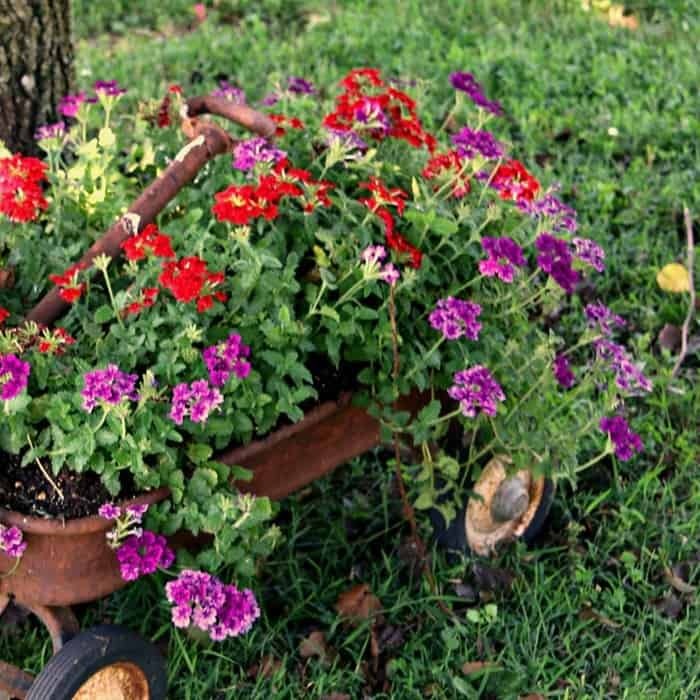 The rusty wagon flower planter is the star of the show. I love the wagon and it was a $10 thrift store find. I think I’ve mentioned before that I don’t have a green thumb. It’s true. I have to work hard to keep my seasonal flowers from dying on me. So far so good although it’s been incredibly hot for this time of year and we were out of town for a few days and one of the poor things was sooooo thirsty. She almost didn’t make it. The wagon has been used in Christmas displays on the front porch and it also held flowers last Summer. It just hung out around the tree by the shop over the winter. It was full of potting soil and dead flower vines. 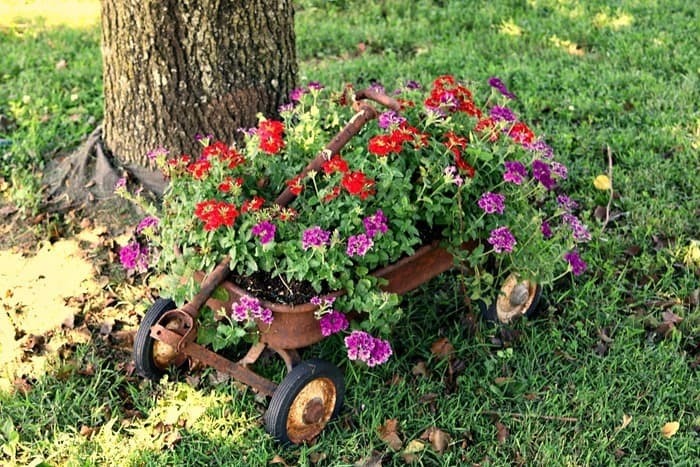 I bought new flowers this year and redid the rusty wagon flower planter for Summer number two. I’m surprised the bottom hasn’t rusted out. The wheels still work good too. I pulled the wagon out of the way when the JTS was mowing the yard last week. I bought a new pink flamingo to stand beside the one I bought a few years ago. You can see how the first one faded. 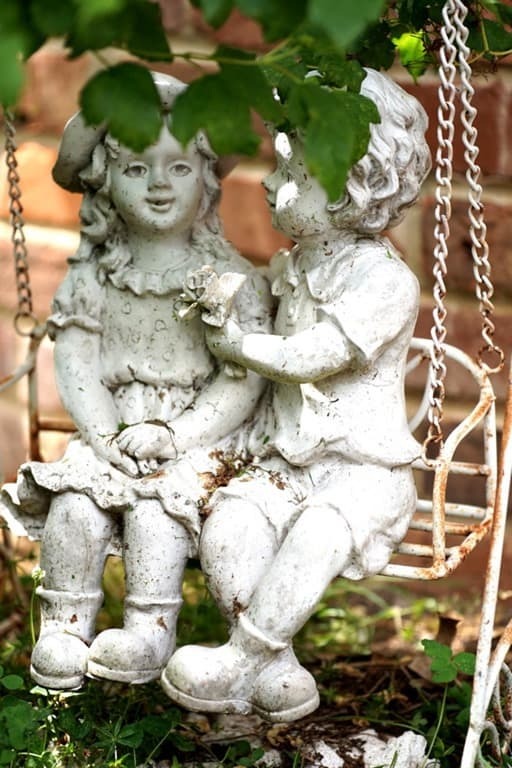 The boy and girl lawn ornament is a find from my favorite junk shop. I love the expression on their faces and the swing is so cute. It actually works. 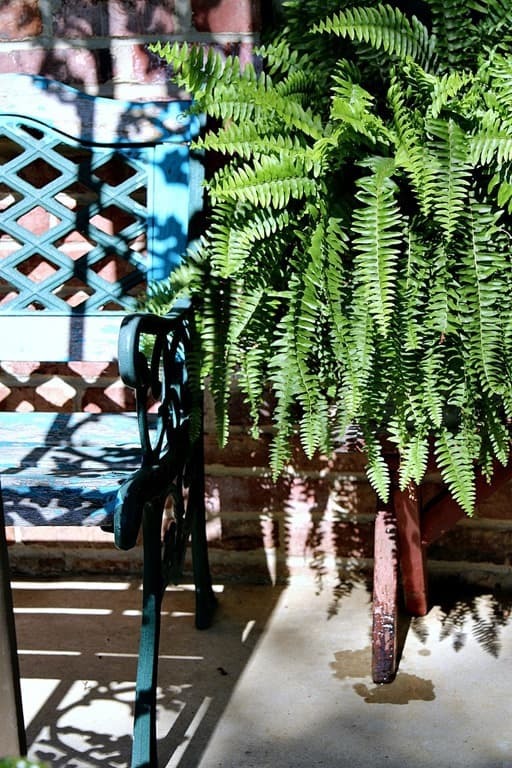 You can’t see the stand in this photo but you can see it on the post here with photos of my Summer porch 2017. 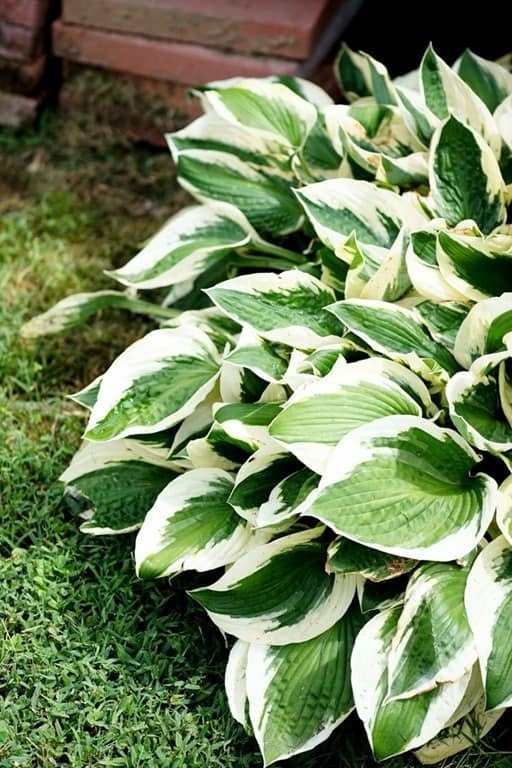 This large hosta is one of two that survived the Deer. I planted hostas all around our deck many years ago and the Deer ate most of them to the ground and they didn’t make it past 2 or 3 years. You guys probably remember the vintage glider I painted last Summer. I never did get the boards painted that we used to raise the height of the glider a bit. That’s okay, I’m going to paint the glider bold yellow. 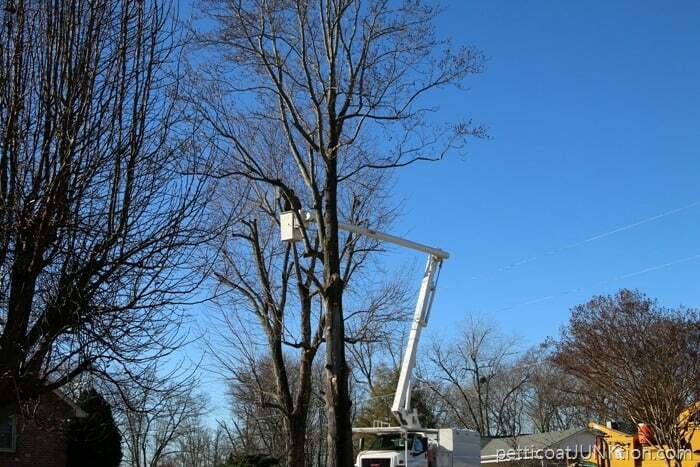 That was my first color choice last year and I think I’m going to do it…..once the weather cools down. This time I’m going to use my HomeRight Finish Max paint sprayer instead of canned spray paint. 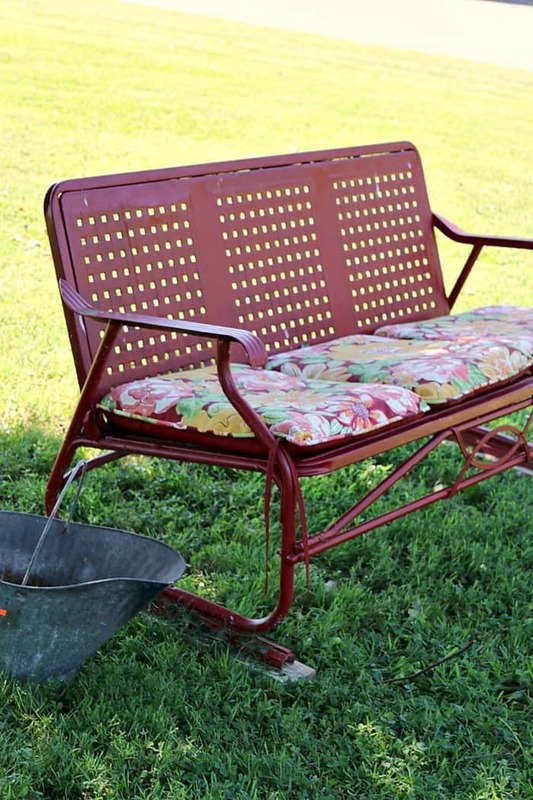 The coal scuttle sitting beside the glider is a new purchase. I plan to put some flowers in it too. Just haven’t gotten around to it yet. 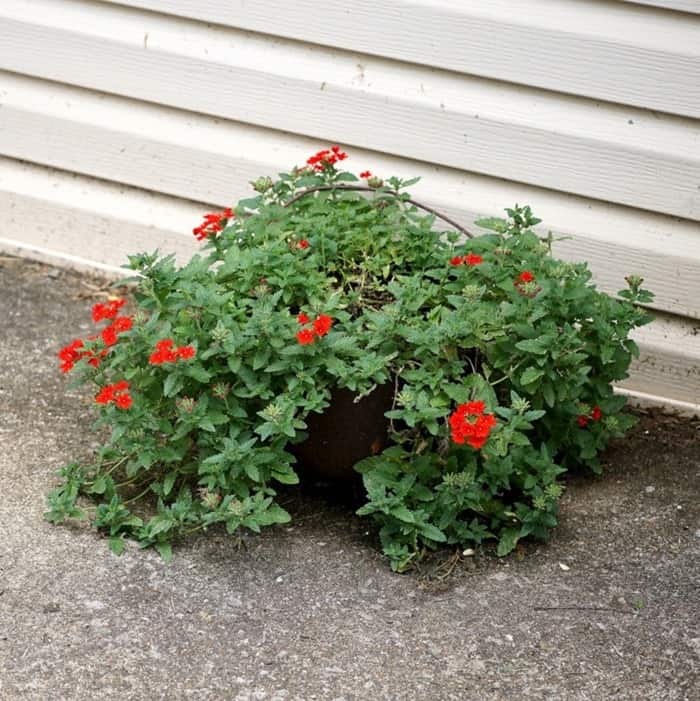 I might make a container garden with several different plants in it similar to these. 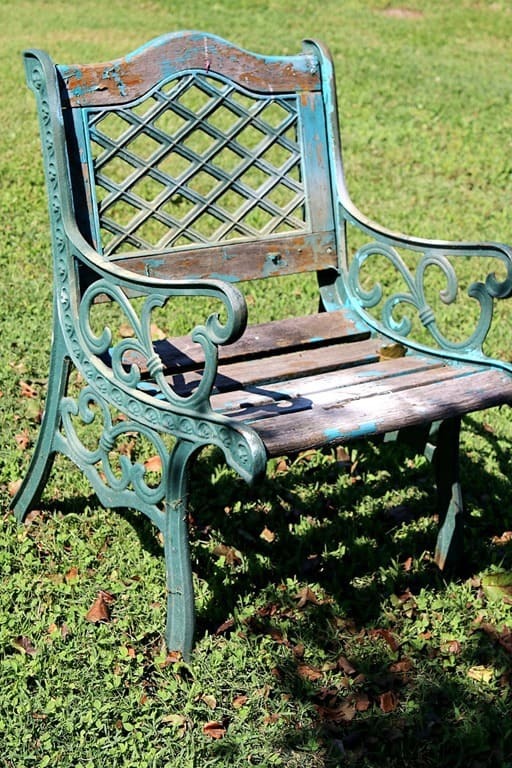 The cool chippy turquoise chair came from my favorite junk shop. ( I say that a lot don’t I. I buy everything there!) You would not believe how heavy this chair is. I can barely move it by myself and I can move around some pretty heavy furniture. I don’t have to worry about it blowing over in a storm. Maybe getting caught up in a tornado funnel. 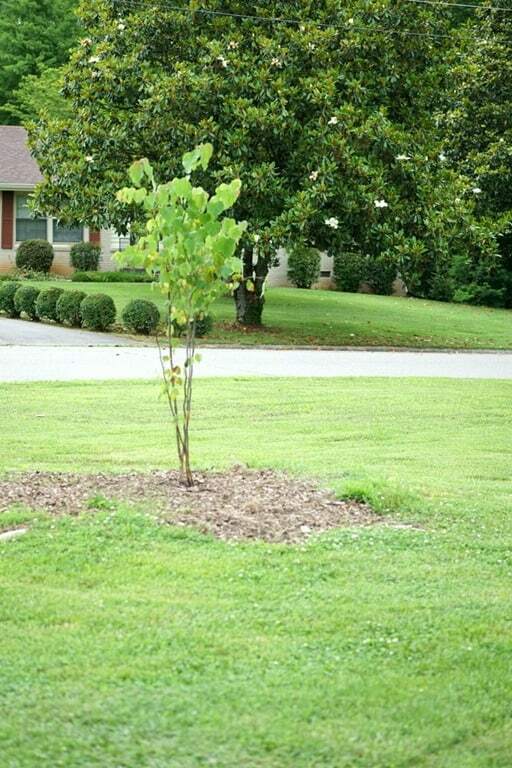 We planted this small Redbud tree in May to replace the giant Tulip Poplar that was struck by lightning in 2016. I sure miss that tree too. We were lucky it didn’t fall on the house. We were in Arkansas when it happened. I’m kind of glad. I kept the front porch and back door area Summer decor to a minimum this year. I have a couple of ferns in repurposed containers under the carport around the back door. 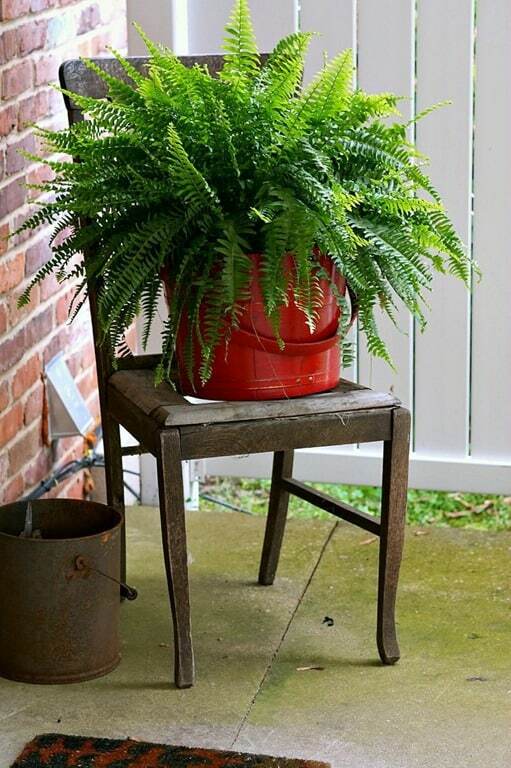 This fern is sitting in the sewing bucket I repurposed a couple of years ago. I removed the legs this year. The antique iron pot holds the flowers that almost didn’t make it. I watered them really good after we returned home and they are going to be okay. This photo was taken earlier this year. At one point the plant was a mass of blooms like the ones in the rusty wagon. 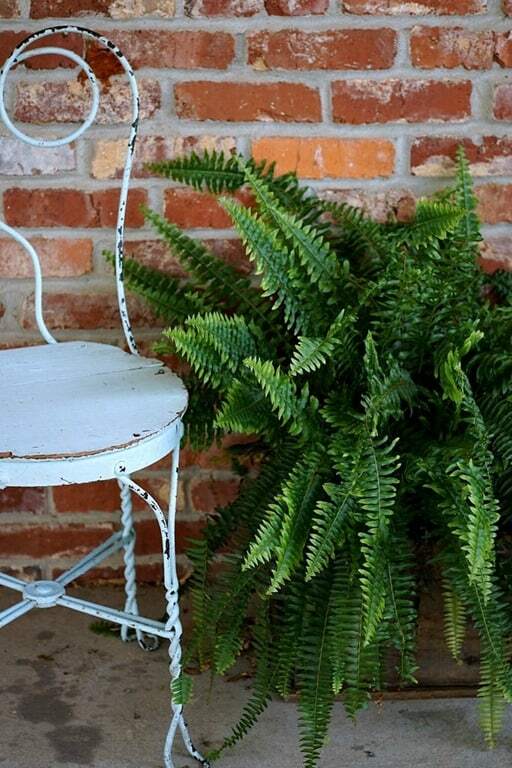 On the front porch I have a fern and a few potted flowers. I love these flowers. I’m not even sure what they are called. The simple basket is perfect for them. I left the fuchsia flowers in the original container from the garden store. But, I did sit them on the rusty star chair from the junk shop. 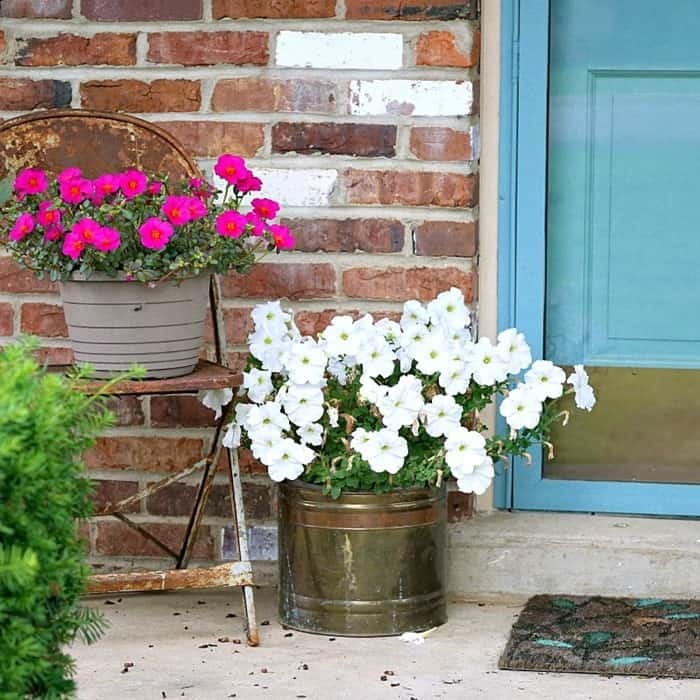 The white morning glories are in a brass container I’ve used on multiple occasions. Oh boy, how these flowers make me smile. The color is so vibrant. I forgot to mention I have a pair of the chippy turquoise chairs. One on the front porch, one on the lawn by the workshop. 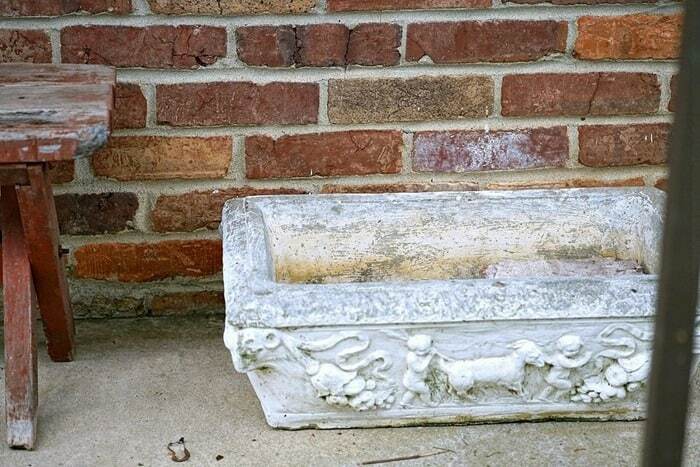 I have a pair of cement planters that came with the house when we bought it. They did sit on the front porch right behind the shrubs and you couldn’t see them. I moved them around this year but didn’t put any plants in them. They are very, very heavy. I love the designs on the sides. I tried researching them but didn’t come up with any similar ones. I have no idea how old they are. I know our house was built in 1965. Maybe they were bought new then. 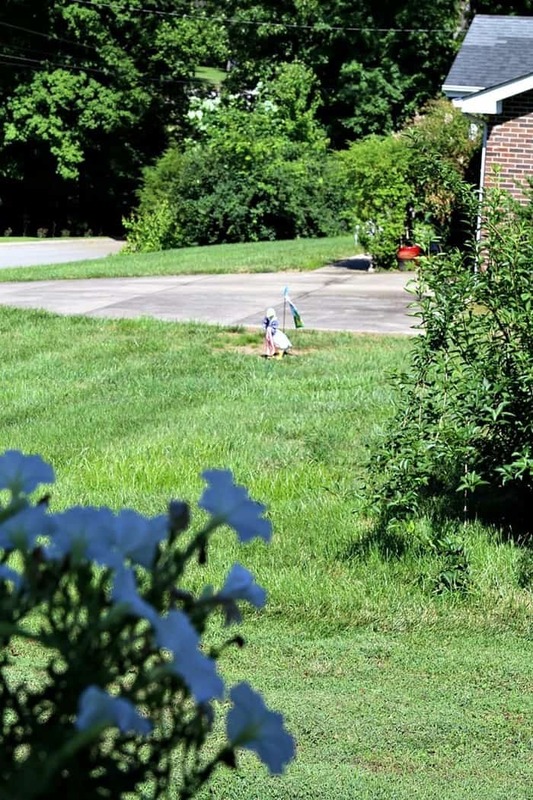 One last photo looking from the workshop driveway to my neighbor’s yard where I can see the freshly painted goose lawn ornament. The paint job is holding up! 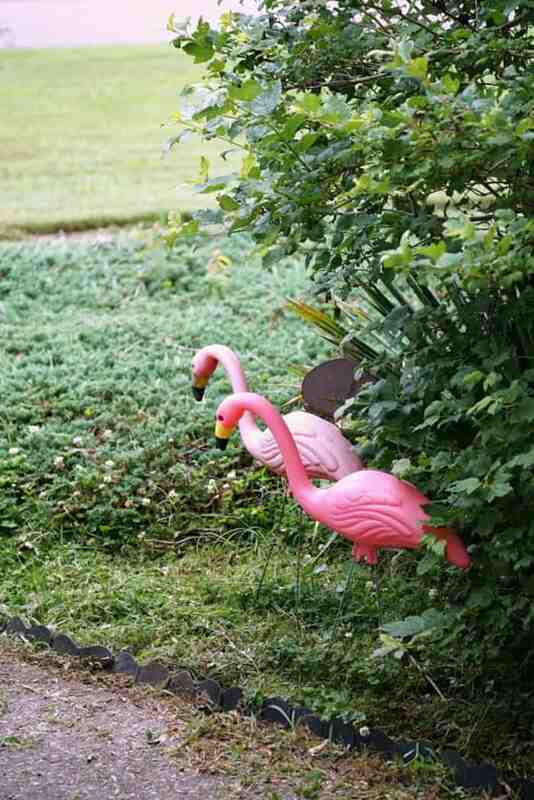 I drove by a yard the other day which had a purple flamingo. I want one. 🙂 I do have the same little boy and little girl, but he is sharing an ice cream cone with her and they are sitting on a bench which is separate. The flowers are actually purslane, also called moss rose. 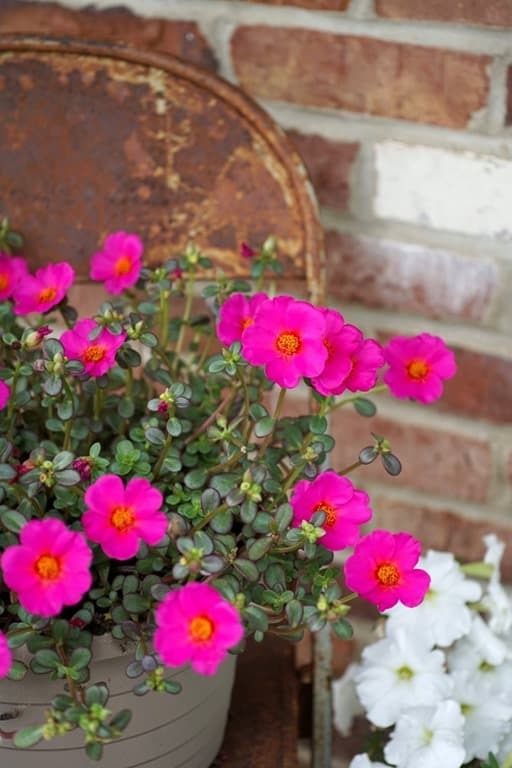 Portulaca have needle shaped leaves, where purslane has the paddle shaped leaves. Both are terrific for hot sunny areas and gorgeous when they are blooming. Thanks for all the info Patty. I love the flowers and I sure would like to have a purple flamingo 🙂 I just googled and found one on Amazon but the price is insane, $30+. I would buy a pink one and spray paint it purple. I got my pink one at Home Depot or Lowes. 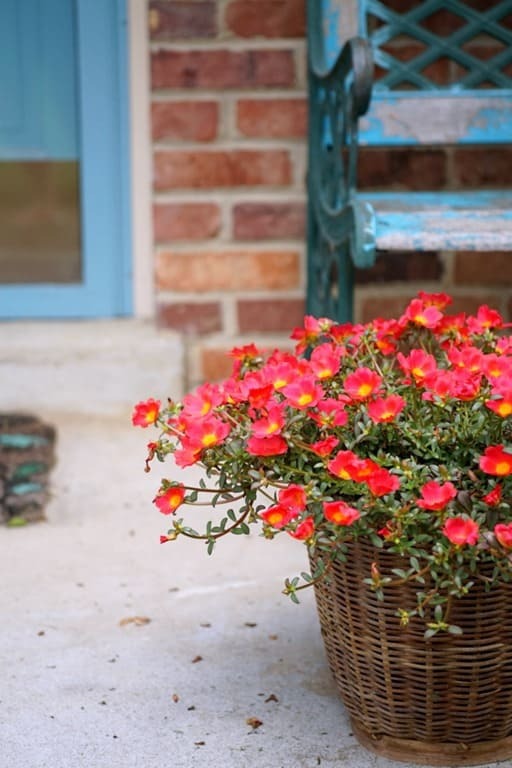 The flowers are portulaca aka Moss Rose. Love them.